These decadent red velvet cupcakes are impressive to look at and taste even better. Let’s get started because I’m sharing ALL the tips! Sometimes, you just get it right and if you’re a fan of red velvet anything, this is oh-so-right. 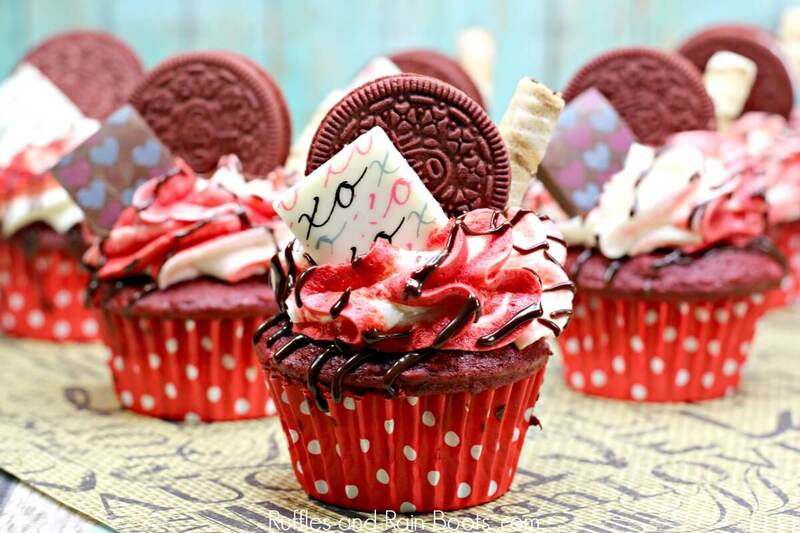 These decadent red velvet cupcakes are impressive to look at and taste even better! I love red velvet. No really, I luuuuuuuv red velvet anything. A cupcake topped with cream cheese frosting? Sign me up! Red velvet hot cocoa in the cold winter months? You bet. This fun cupcake doesn’t disappoint, so let’s get started. 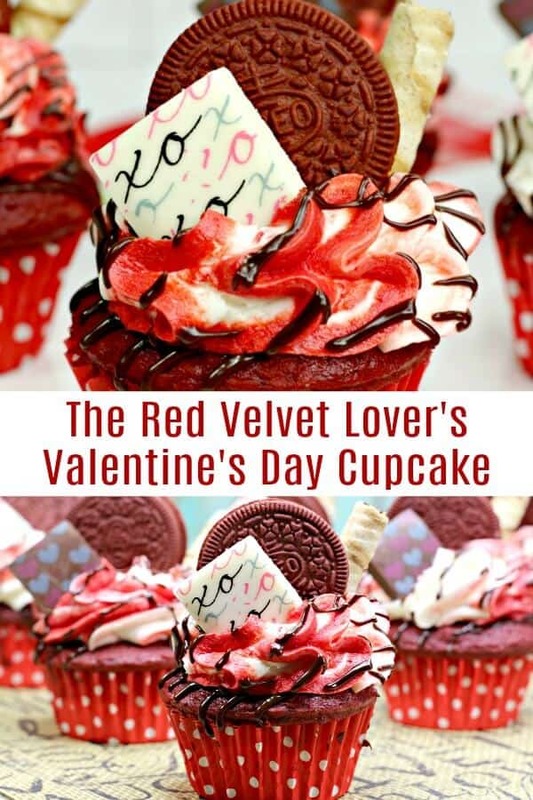 And don’t forget about all of our other amazing Valentine’s Day cupcake recipes here. These red velvet cupcakes are just so pretty and you don’t have to be a master cake decorator to pull them off. 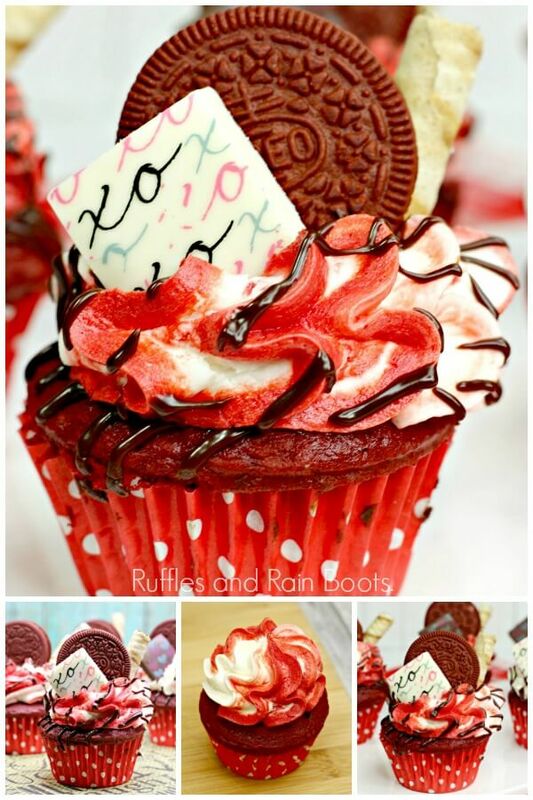 Here are a few tips to make sure your cupcakes turn out wow-worthy. This is a moist cake recipe, so you’ll be just fine to make them the day or night before. Just store them on the counter, covered. If you fill your cupcake liners really full, you’ll have 18 really big cupcakes. If you fill them two-thirds full, you’ll get 24. You’re going to get asked to make a lot of cupcakes if you make the chocolate extra bits. If you don’t want to become the “go to cupcake lady,” buy these chocolate curls. 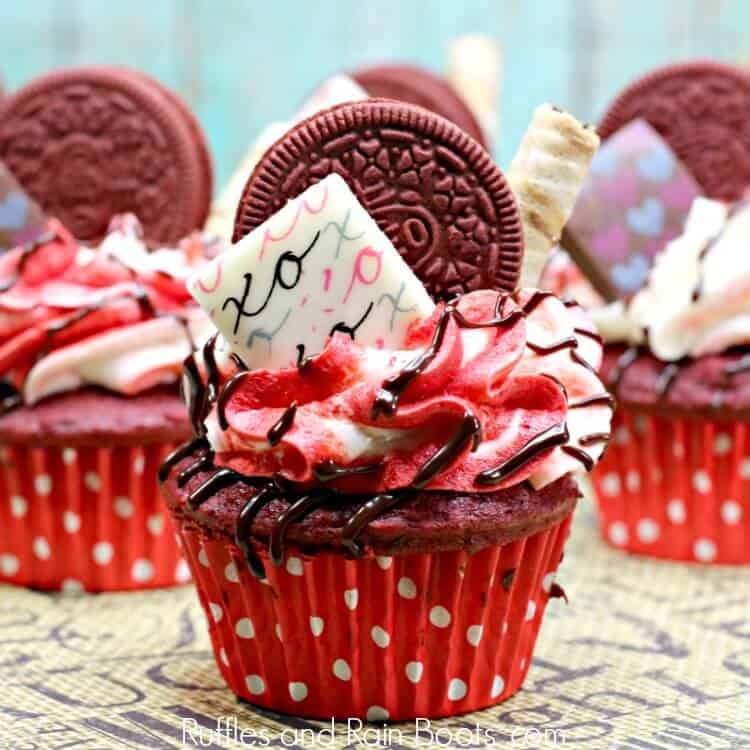 These decadent red velvet cupcakes are the perfect treat for an anniversary or Valentine's Day. They are WOW-worthy, indeed! Cupcake Directions - Preheat oven to 350 degrees F and line the muffin pan with cupcake liners. In a large bowl, whisk together flour, cocoa, baking soda, and salt. Using a stand mixer if you have it, beat together butter, shortening, and sugar until fluffy. Mix in the egg, vanilla, red velvet extract, and coloring until combined. Add the dry ingredients to the mix, alternating between dry mix and milk until incorporated. Scoop batter into liners. For more cupcakes (24), fill two-thirds of the liner with mix. For more robust cupcakes but less quantity (18), fill three-quarters of the way. Bake cupcakes between 19-22 minutes, depending on your oven until a toothpick comes out clean when poked into the centers. Allow to cool completely. Frosting Directions - Using a stand mixer, beat together the butter, cream cheese, powdered sugar, vanilla, and heavy whipping cream until smooth, stiff peaks form. Note: you want the frosting to be stiff so it will maintain its shape. Split the frosting into two bowls and color one with red coloring. Stir until combined. Candy Directions - Carefully remove the squares from the decorated candy sheet. Place them into your mold and add either white or milk melted chocolate to them (per the package instructions). Allow them to harden. Red Velvet Cupcake Assembly - Place the piping bag into a tall cup and fold down the edge. Scoop red frosting into the bag, forming 4 lines around the piping bag. Add the white frosting to the bag normally. Pipe the colored frosting onto the cupcakes by starting with a small mound in the center. Then, create a tall swirl by starting from the outside and lifting the piping bag vertically. Drizzle the chocolate sauce onto the frosting. 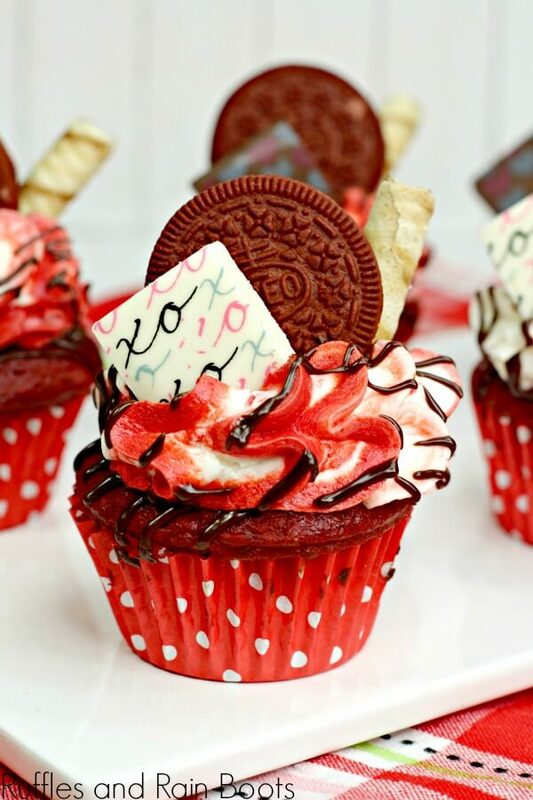 Add a red velvet Oreo cookie to the center back of the frosting and a candy piece to the front. Finish it off by adding a cookie stick off to one side behind the Oreo. This recipe looks extensive but it's not. You can always start with a boxed red velvet cake mix, if you prefer to skip that section.